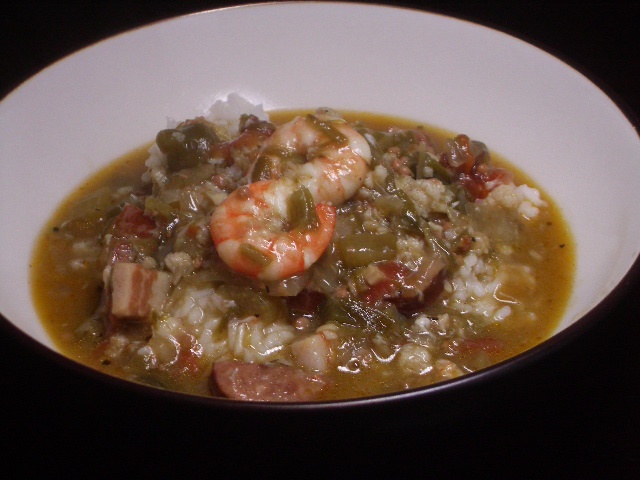 This recipe is adapted from gumbopages.com, and has done at a great job at recreating the flavors that I remember from childhood. Obviously, there are multiple variations on seafood gumbo; my seafood gumbo isn’t yours, and you can add or subtract (within reason) anything you want to. We took out the oysters because of expense, but by all means, include them if you want to! Speaking of expense, because of the large list of ingredients, this isn’t a particularly frugal recipe. We decided to not even worry about the price list – live it up and have gumbo tonight and enjoy the leftovers for weeks!! Just a warning: Don’t start this recipe without first looking at the ingredients and doing your prep work (or as the French say, your mise en place). First, get up your roux. In a super large pot*, heat the oil and then stir in the flour when its hot. STIR CONSTANTLY. The roux should turn from blond to a light brown and at this point, add the onions, peppers, celery and garlic. Cook until the onions are translucent, and then add your stock and your tomatoes. Keep stirring for the first few minutes to make sure it all meshes together. Cook for 1o-15 minutes. While this cooking, brown the kielbasa sausage in a skillet. Once the kielbasa is adequately browned, add this to the pot. Next, add the okra and the seasonings. Bring it to a boil, and then reduce the heat to medium low. Keep this going, in a covered pot, for hours. We’ve found that the longer you slow cook this beautiful combination of flavors, the better it gets. If you have all afternoon, and you’re hanging out around the house, cook it from 3 until dinner. In any case, we would NOT recommend anything less than 2-3 hours of cooking once everything (excluding the actual seafood) has come together. About 30 minutes before serving, get the rice steaming. Then, about ten minutes before serving, add in the crab and the shrimp (and the oysters if you’re using those!). Serve in bowls; place about a half cup of rice in each bowl and then ladle the gumbo over it. ENJOY! *When making a full recipe, we have to use two pots because we don’t have one that’s big enough. We start everything in one big pot, and then at the step when the okra is added, we divide it into two pots and divide everything evenly from there.